Solodev CMS Enterprise Edition for Docker lets you "dock" with space-age capabilities and best-of-breed features powered by Amazon Elastic Container Service (ECS) and Docker. Available on-demand with convenient hourly billing or annual options. Expand your digital universe and launch your next amazing website, mobile app, or dream project with the Solodev Content Management System (CMS) - built exclusively for AWS, and available in an on-demand subscription via the AWS Marketplace. With Solodev, organizations can build anything they imagine with total design freedom and control. Create rich, enterprise-level websites and digital experiences that engage audiences. Customize your projects with advanced functionality and integrate with an expanding galaxy of third-party applications. Solodev can take your further than you ever thought possible. Whether you're a marketer or an experienced engineer, Solodev offers the best of all worlds, allowing you to explore your most innovative ideas in the cloud. Easy to use for non-technical content marketers yet robust enough for ambitious designers, Solodev is also the developer's preferred tool for creative customization. Publish content rapidly without any code. Design agency-quality websites. Integrate seamlessly with your CRM or marketing stack. Build complex, API-driven modules and applications like blogs, eCommerce shopping carts, career portals, inventory systems and more. Connect and manage your content experiences across the IoT. With Solodev, the digital universe is yours. Solodev CMS Enterprise Edition for Docker: Get ready to "dock" with the space-age power of containers and explore new worlds of productivity! 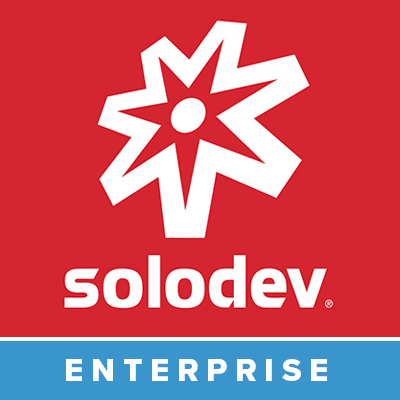 Built exclusively for AWS with fully containerized orchestration for Docker, Solodev empowers you to run and scale at will - so you can focus on building, deploying, and managing your applications and not the underlying infrastructure. Solodev integrates with the most essential cloud technologies in the AWS stack, including Amazon Elastic Container Service (ECS), Amazon Virtual Private Cloud (VPC), Amazon Elastic Compute Cloud (EC2), Amazon Elastic Load Balancing (Application Load Balancer), Amazon Relational Database Service (RDS), Amazon Elastic File System (EFS), Amazon Simple Storage Service (S3), Amazon CloudWatch, Amazon CloudFront, Amazon Route 53, Amazon Certificate Manager (ACM), Amazon Web Application Firewall (WAF) managed by Amazon OpsWorks and deployed by AWS CloudFormation. Cloud-first, on-demand enterprise CMS designed exclusively for Amazon Elastic Container Service (ECS) and Docker. Convenient hourly billing or annual options available. Total design freedom: create amazing websites and digital experiences that are easy for non-technical content marketers to use and manage. Advanced functionality for developers: build custom applications and third-party integrations with unlimited capabilities, including blogs, shopping carts, career portals, and more.